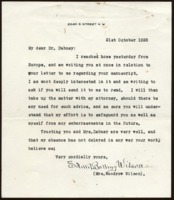 John Randolph Bolling writes to Richard Heath Dabney, regarding Edith Bolling Wilson’s receipt of Dabney’s article. 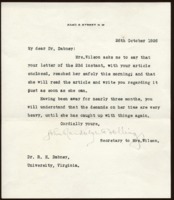 Edith Bolling Wilson writes to Richard Heath Dabney, regarding his manuscript. Woodrow Wilson discusses his work at Princeton University and his writing plans with his friend Richard Heath Dabney. 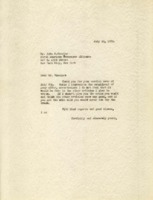 Woodrow Wilson compliments his friend Richard Heath Dabney’s aunt's book and offers him a teaching assistant position at Bryn Mawr University. 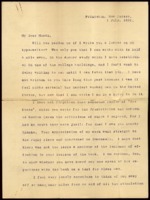 John Wheeler thanks Gladys Newman and asks her to keep him updated on Cary Grayson’s writing. John Wheeler writes to Cary Grayson wishing him improved health and saying that he would like to read his book once it has been written. John Wheeler reminds Cary Grayson that he is still interested in reading his book if it has been written. John Wheeler asks if there is any progress on Cary Grayson’s book. 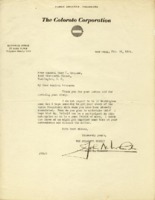 John Wheeler accepts Cary Grayson’s refusal to write an article, but is pleased at his plans to write a book and says he would like a chance to read it. 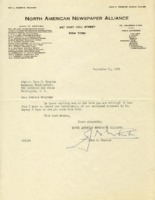 Cary Grayson declines John N. Wheeler request to write an article. John Wheeler asks Cary Grayson if he has written his story or solidified his plans to do so. 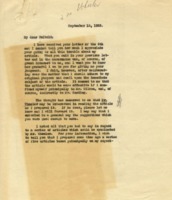 John N. Wheeler thanks Cary Grayson for his revisions and inquires as to his plans for writing the full story about his service to three different presidents. 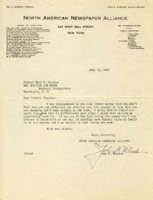 Cary T. Grayson rejects Louis Seibold’s suggestions for articles about his work as White House physician and mentions earlier articles that he decided not to publish. He also mentions Wilson’s concern over his health. 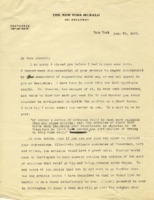 Louis Seibold asks Cary T. Grayson about possible edits to the articles he is writing, mentions a visit to a sick friend, and congratulates Grayson on his horse winning the Saratoga Cup. Louis Seibold praises the articles that Cary T. Grayson has been writing regarding his experience as a White House physician and recommends further elaboration. 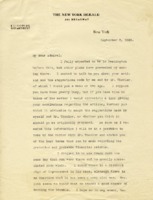 Louis Seibold writes to Cary T. Grayson about articles that he is planning to write about his experiences as a physician at the White House. 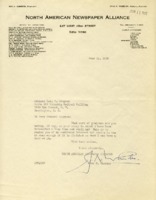 M. E. Hennessy sends Cary Grayson a clipping of an article he wrote. 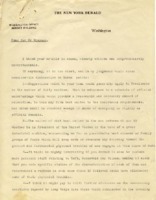 Woodrow Wilson thanks W.M. 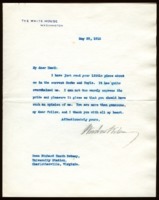 Jackson for his congratulations regarding his book, History of the American People.